in parallel to Documenta 12, Kassel, Germany, 2007. 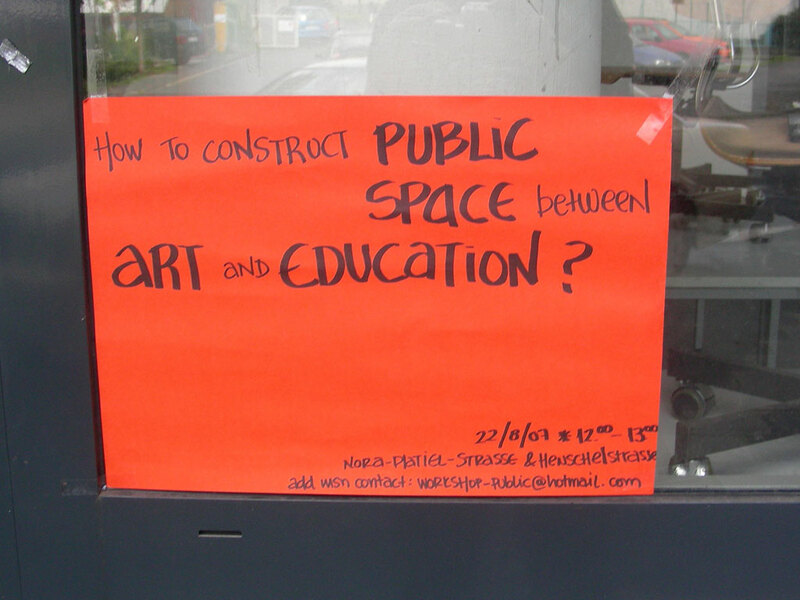 The Workshop: How to Construct Public Spaces between Art and Education? Participants from around the world are invited to discuss the workshop as alternative production site, between art and education. Workshops can provide ways for producing creative work, outside traditional art and education frames. In the context of increasing globalization and privatization of education, as well as the increasing commercialization of art, workshops can function as working environments to establish alternative modes of pedagogy and cultural production, based on experimantation, process, collective work, sharing ideas and skills, collaboration, intervention in everyday environments, etc. We want to discuss the workshop as a new merging site of art, education and everyday space. 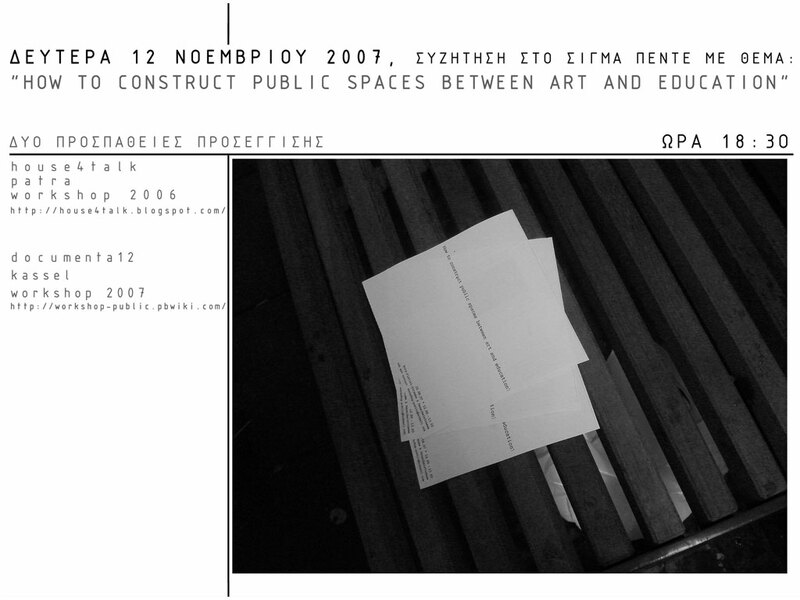 We will present examples of site-specific workshops, initiated at the Laboratory for Visual Arts, at the Department of Architecture, University of Patras. Key issues to be addressed are: the workshop as self-organized initiative to respond quickly to emergent city situations, forms of collaboration, discussion (as form of intervention), mobility (as expansion of the range of an action / activation of different places) networking practices, communication modes, hospitality, public forum, network of localities. The workshop intends to exchange different experiences and viewpoints, and come out with plans for future collaborations and actions. The workshop will be performative: it will be staged in a semi-circular table, equipped with keybords that will transmit live notes of the participants onto a projection screen. The audience can also intervene at any time with questions and comments. Conversations, transmitted notes and interventions from the public will define the outcome, as juxtaposition of multiple statements.